The report covers comprehensive information about market trends, volume (‘000 units) and value (US$ Mn) projections, market dynamics, competition and recent developments in the Global Electric Motors Market for the study period 2017 to 2027. The global electric motors market is expected to reach a little over US$ 145 Bn by the end of forecast period, registering a CAGR of 4.7% for the period between 2017 and 2027. Advancements in manufacturing techniques, increasing adoption of robotics and rapid introduction of automated features in industrial products, appliances and consumer goods are some of the factors expected to lay robust foundation for the growth of the global electric motors market. AC electric motors primarily consist of induction motors. Synchronous motors are expected to dominate the market, in terms of value, during the entire forecast period. AC electric motors find extensive usage where requirement of power usually ranges between medium to high (usually over 100 HP). This usage characteristic makes them preferable for usage primarily in industrial applications. Among AC electric motor types, induction motors are expected to register 1.1X the growth registered by synchronous electric motors during the study period. AC electric motors are more expensive than DC electric motors and the difference is significantly high for some of the specific applications. The importance of this factor can be understood from the fact that in 2015, the market share held by AC electric motors was 2.8 to 3 times the share of DC electric motors by value. On the flipside, the market share of AC electric motors was about 2X less than the market share of DC electric motors by volume. Electric motors are widely utilized in all industrial, automotive and consumer products across various industry verticals. Electric motors constitute a critical component in most of the appliances and machinery. Pumps, fans and compressors are the top three applications of electric motors and represent nearly about three-fifth of the total sales value of electric motors. These segments are collectively expected to gain between 2.5% and 3% market value share over the forecast period. The other applications considered in this electric motors study include general machinery, centrifugal machinery, grinders, extruders and other manufacturing applications. All other applications are collectively expected to grow by 4.3% CAGR in terms of value over the forecast period. In addition, all these segments are collectively expected to account for about 35% share in the total incremental $ opportunity created in the global electric motors market. Amongst all end use industries analyzed in this global electric motors market study, the automotive industry is expected to register about 1.08X growth in terms of value. Increasing addition of comfort-enhancing and automated features, apart from regular deployments, in automobiles is expected to offer new growth prospects for automotive electric manufacturers across the globe. In terms of incremental $ opportunity, Industrial and Automotive sectors are expected to compete within close margins. Both the end use sectors are expected to occupy over 85% share, by value, by the end of 2027. 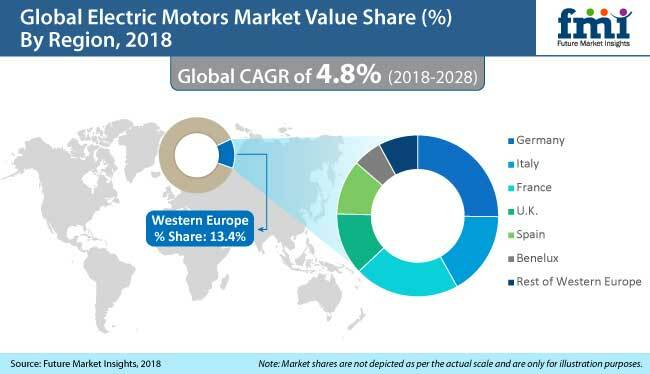 Increasing industrial production, stable economic conditions and consistent growth in automotive and consumer electronics and appliances sales in the region is expected to drive growth in demand for electric motors market in the region. Relatively established manufacturing sector in the region and increasing industrialization and urbanization will create a robust platform for the growth of the electric motors market. Asia Pacific excluding Japan (APEJ) region is expected to register 1.3X above average growth in the market and will be followed by North America and Western Europe in terms of value. Regions including North America and APEJ are expected to gain traction during the latter half of the forecast period owing to the anticipated growth of the manufacturing and automotive sector in these regions. All the other regions are expected to exhibit moderate growth during the same period. Apart from North America and APEJ, all other regions are expected to lose market value share by the end of the forecast period. Collectively, APEJ and North America are projected to register a CAGR of 5.2%, by value, which is 1.4X more than collective CAGR of all other regions. The global electric motors market is fragmented, with no single market player holding substantial double digit market share as of 2017. Globally, the top 10 players in the market collectively hold between 25% and 30% of the market share. In the recent past, the electric motors market has witnessed significant developments from the competition perspective. New product launches, acquisitions and collaborations are some of the key preferred strategies opted by key players to expand and sustain in the global electric motors market. In April 2017, Nidec Motor Corporation introduced a new line of medium voltage AC motors, typically for use in pumps, blowers, fans and conveyor systems. These models are available between the range 150 HP and 600 HP. Some of the prominent players covered in this market study on the Global Electric Motors market include ABB Group, Allied Motion Technologies Inc., Arc Systems Inc., Bonfiglioli Riduttori S.p.A., East West Manufacturing, LLC, Emerson Electric Company, General Electric, Hitachi Ltd, Hyosung Corporation, Hyundai Electric & Energy Systems Co. Ltd., Johnson Electric, Kirloskar Electric Company Ltd., Nidec Corporation, Regal Beloit Corporation, Robert Bosch GmbH, Schneider Electric SE, Siemens AG, Toshiba Corporation and WEG S.A.
How the electric motors market has evolved in the past four years? What shape is the electric motors market expected to take in terms of volume and value during the study period? What are some of the prevailing market dynamics in the electric motors market? What are the competition developments and trends in electric motors market? What are some of the underlying macro-economic and industry factors impacting the growth of the electric motors market? How the competition is structured at present and how has it evolved in the electric motors market over the past few years? Future Market Insights (FMI) offers a 10-year forecast for the electric motor market for the period between 2017 and 2027. In terms of value, the electric motor market is expected to register moderate CAGR during the forecast period. This electric motor market study demonstrates the global market dynamics and trends which influence the current nature of the Electric Motor market and are capable of affecting the future status of the market over the forecast period across seven regions: North America, Latin America, Western Europe, Eastern Europe, APEJ, Japan and MEA. This research report provides a detailed analysis of the electric motor market and offers insights on the various factors driving the popularity of electric motors. This electric motor market report includes an extensive analysis of key industry drivers, challenges, market trends and market structure. The electric motor market study provides a comprehensive assessment of stakeholder strategies and imperatives for succeeding in the business. The report segregates the market based on technology, application and different regions globally. The electric motor market is expected to witness significant value growth during the forecast period owing to increasing replacement rates and demand for energy-efficient motors by various industry verticals. The report starts with an overview of the electric motor market in terms of value. In addition, this section includes an analysis of key trends, drivers and challenges from the supply, demand and economy side, which are influencing the electric motor market. The electric motor market has been classified on the basis of basis of product type, power output, application, end-user and region. By product type, the electric motor market is sub-segmented into AC motor and DC motor. By application, the market is segmented into pumps, fans, compressors, general machinery, centrifugal machinery, grinders, extruders and others. Furthermore, by power output, the global electric motor market is segmented into <1HP, 1-500 HP and above 500HP. The <1HP sub-segment accounted for a relatively higher share owing to increasing demand for highly-efficient and low-cost motors worldwide. A detailed analysis has been provided for every segment in terms of market size analysis for the electric motor market across different regions. This section provides a detailed analysis of key trends. The next section contains a detailed analysis of the electric motor market across various countries in the region. This section provides the market outlook for 2017–2027 and sets the forecast within the context of the electric motor market, which includes latest technological developments as well as offerings in the market. This study discusses key trends within countries contributing to the growth of the market as well as analyses the degree to which drivers are influencing this market in each region. Key regions and countries assessed in this report include North America (the U.S., Canada), Latin America (Brazil, Mexico & Rest of Latin America), Western Europe (UK, France, Germany, Spain, BENELUX and Rest of Western Europe), Eastern Europe (Russia, Poland & Rest of Eastern Europe), APEJ (India, China, ASEAN and Rest of APEJ), Japan and MEA (GCC Countries, Turkey, South Africa, and Rest of MEA). This report evaluates the present scenario and the growth prospects for the Electric Motor market across various regions globally for the period 2017 –2027. We have considered 2016 as the base year and provided data for the forecast period. To offer an accurate forecast, we started by sizing the current market, which forms the basis of how the electric motor market will grow in the future. Given the characteristics of the market, we have triangulated the outcome of different types of analysis based on technological trends. As previously highlighted, the global electric motor market is split into a number of segments. All segments have been analysed in terms of basis points to understand the relative contributions of individual segments to market growth. This detailed information is important for the identification of the various key trends affecting the global electric motor market. In addition, another key feature of this report is the analysis of all key segments in terms of absolute dollar opportunity. This is traditionally overlooked while forecasting the market. However, absolute dollar opportunity is critical in assessing the level of opportunity that a provider can look to achieve as well as to identify potential resources from a sales and delivery perspective in the global electric motor market. In the final section of the report, we have included a competitive landscape to provide clients a dashboard view based on the categories of providers in the value chain, their presence in the electric motor market and key differentiators. This section is primarily designed to provide clients an objective and detailed comparative assessment of key providers specific to a market segment in the electric motor supply chain and the potential players for the same. Report audiences can gain segment-specific vendor insights to identify and evaluate key competitors based on an in-depth assessment of their capabilities and success in the marketplace. Detailed profiles of providers have also been included under the scope of the report to evaluate their long-term and short-term strategies, key offerings and recent developments in the Electric Motor market. Some of the key competitors covered in this report are ABB Group, Johnson Electric, Nidec Corporation, General Electric, Toshiba Corporation, Allied Motion Technologies Inc., Regal Beloit Corporation, Hyundai Electric & Energy Systems Co. Ltd., Hyosung Corporation, Siemens AG, Emerson Electric Company, Schneider Electric SE, Hitachi Ltd., Robert Bosch GmbH, Kirloskar Electric Company Ltd., WEG S.A., Bonfiglioli Riduttori S.p.A., Arc Systems Inc. and East West Manufacturing, LLC.